Reindeer pepper the walk: mainly small family groups of does and calves, but with the occasional proud, solitary stag silhouetted on a hill as if auditioning for a whisky advert. 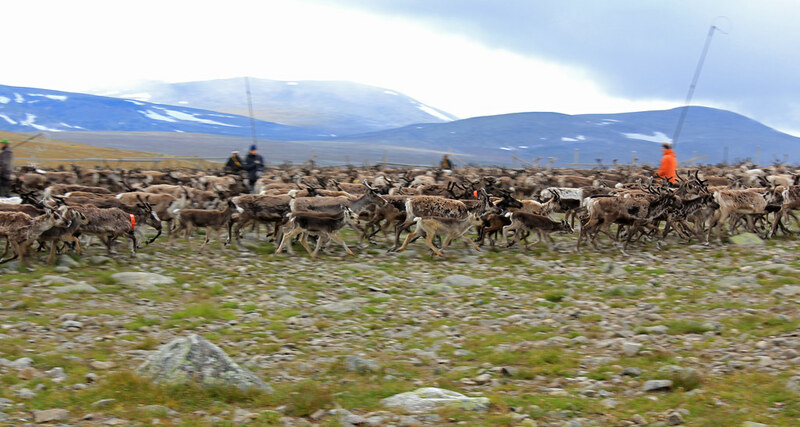 At one mountain pass, a small herd split around us as they were driven through by their Sami herders. 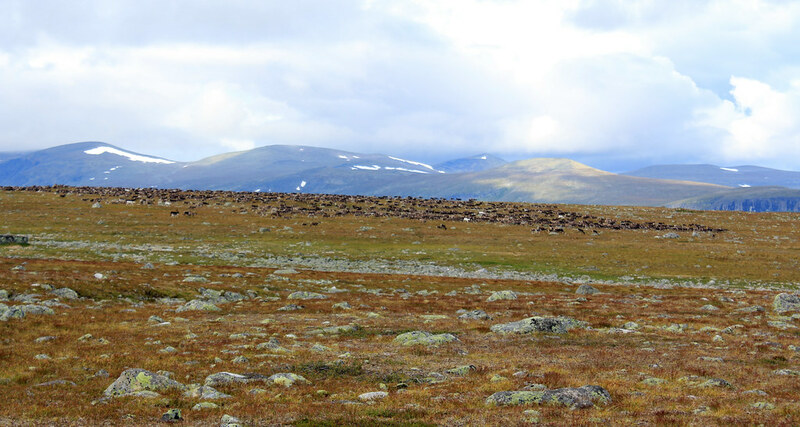 The Sami have been herding the animals for centuries, ranging across their homeland, which stretches over Norway, Sweden, Finland and Russia. 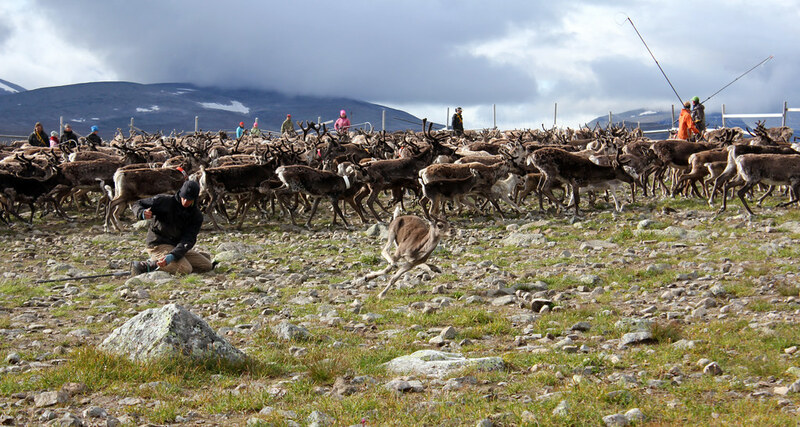 These days only around 2800 (10 percent) Sami people are engaged in reindeer herding, and their nomadic way of life has been largely replaced by a semi-nomadic cycle through the year as they move their herds between grazing grounds. But they still live across the porous mountain borders with their own languages and culture, and their stateless life has put them at odds with the governments of the regions. That the State Institute for Racial Biology in Uppsala was forcibly sterilising Sami women until 1975 gives something of the bitter flavour of the linguistic, religious and racial discrimination and abuse they have suffered. Even now, despite better recognition of their culture, they continue to experience threats to their way of life and environment. Chasing reindeer and taking photographs is difficult. Initially the reindeer were compliant. They lowed and they stamped and bustled nervously against each other, but they kept on going. Then, as we got them on to one side of a long funnel of fencing that ran toward the centre of the rengard, it was as if a thought struck them all at once, a realisation of their fate. The herd turned. 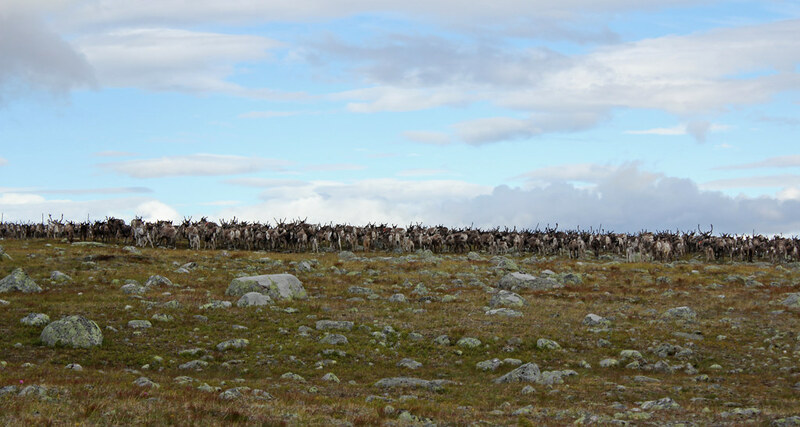 The reindeer were now heading straight for us. It’s hard to describe the feeling you get when a solid line of six-foot-high antlers is advancing on you and all you have to defend yourself with is a woolly hat. (The Sami, it should be said, were still on or next to their bikes.) The only defence available, as signalled by the herders, was to wave our arms frantically above our heads. But with half a dozen of us and several hundred of them bearing down on us, I wasn’t convinced. Luckily reindeer seem to be bad at weighing odds and the arm-waving did the trick: the herd turned back and cantered anxiously into the circle of fences. A calf escapes after tagging.